The large size of trucks should come as no surprise to anyone who has seen a refrigerated trailer on the road. Most can carry cargo that weighs up to 25 tons. What may be surprising to many is the type of cargo that is being held. Consumables make up the vast majority of products. Fruit and vegetables account for 33 percent of refrigerated food, not including bananas. This is due to the fact that bananas represent a full 21 percent of all food items shipped in this way. Meat and poultry are only slightly higher at 25 percent. Seafood, which requires a much lower temperature than fruits and vegetables, comes in last place at 20 percent. Food is not the only consumable shipped via refrigerated shipping trailers. Most medicine must be kept colder than average air temperature. The labels on drugs that read, “keep in a cool, dry place” apply to shipping as well. More specifically, vaccinations must be kept at 35 to 46 degrees Fahrenheit in order to remain potent. Without refrigerated trailers, these vaccinations would be useless. Because refrigerated transport services offer humidity controls as well as temperature controls, cold trailers are ideal for medicine. Non-consumables are also commonly shipped via reefer trucks. Indeed, any item that can be damaged by heat benefits from traveling through a refrigerated shipping trailer. Paintings, particularly those that are of the highest quality, should travel in a cold, dry trailer. Antiques, namely those with very delicate finishes, should never be exposed to heat. A standard shipping container can rise well over 100 degrees Fahrenheit, which could seriously damage priceless heirlooms. Chemicals also often need the protection offered by refrigerated trailers. Flowers are another item that are often shipped via a refrigerated trailer. This keeps the blooms looking fresh and lasting longer than standard delivery. 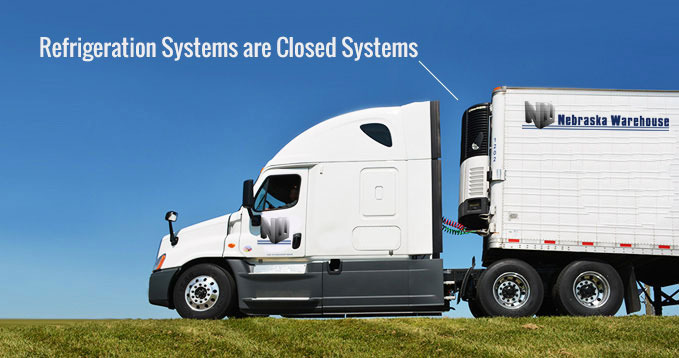 Electronics represent some of the most common non-consumable items shipped by refrigerated trucks. The coolness of the refrigerated container allows batteries, wires, and circuitry boards to ship without the threat of heat damage. Those who attempt to use standard shipping containers should note that the inside of trucks are generally about 30 degrees warmer than the outside. This makes shipping electronics dangerous even on relatively cool days. There are approximately 500,000 refrigerated shipping trailers in operation in the United States alone. These trailers reduce waste by extending the shelf life of many products. They allow delicate items to travel long distances with no harm. They also protect product value, which is a benefit that pays for itself over time.